UK Care Home Industry: Is A New Investment Wave Coming? The U.K. is facing a crisis in social care. Spending cuts and pressure on budgets mean local authorities (LAs) are struggling to fund services for an ageing population, and the shortage of care is adding to the difficulties of the already overstretched National Health Service (NHS). One of the root causes of the problem lies within the care homes sector, where the supply of homes is failing to meet consumers’ needs, especially when local conditions are considered. Public sector funding for care home places is unsustainably low, averaging £620 a week, and covers no more than day-to-day operating costs for many operators, according to the Competition and Markets Authority (CMA). The lack of a viable rate of return on capital invested prevents many care home operators, especially those that have a strong bias towards LA funding, from reinvesting in new capacity. Access to a care home is increasingly becoming a postcode lottery, with the government unable to fulfil its obligation to ensure the availability of good quality, suitable public-pay care. Yet despite the negative headlines, the combination of consumer demand for privately funded care and proposals expected in the government’s summer 2018 green paper suggests that a new wave of investment may be forthcoming to address the U.K.’s long-term care needs. In this Executive Insights, L.E.K. Consulting examines why the U.K.’s underserved care homes market presents an economically viable investment opportunity. Care homes in the U.K., particularly those funded by the public purse, have long suffered from structural underinvestment. 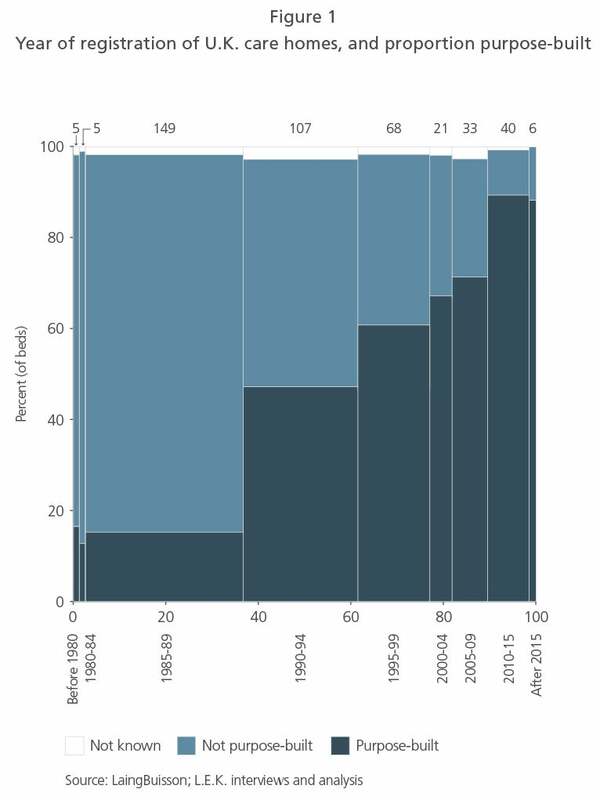 According to public statistics, investment in additional public and private care home capacity was greater than capacity withdrawn in only two out of the five years between 2011 and 2016, and a number of market observers are suggesting an even bleaker picture. Successive years have seen a net loss of capacity at a time when the number of elderly in the population is increasing, along with the subsequent demand for nursing and residential care. An equally serious problem is that many of the existing homes are old and not purpose-built, often resulting in poor service quality and inadequate facilities for residents and carers (see Figure 1). In order to address the shortage of care home places, the sector is estimated to need another 200,000 private and public beds over the next 10 years, equivalent to c. 45% of current capacity. 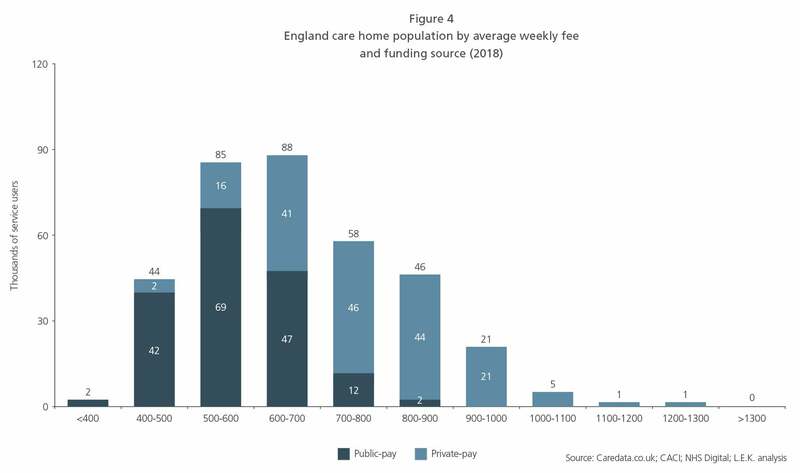 In the publicly funded sector, insufficient weekly fee levels are the result of limited annual increases over an extended period (see Figure 2), making investment unattractive and meaning the building of new care homes in many locations is not economically viable. This is of particular concern given that c. 95% of publicly funded capacity is now provided by the private sector. 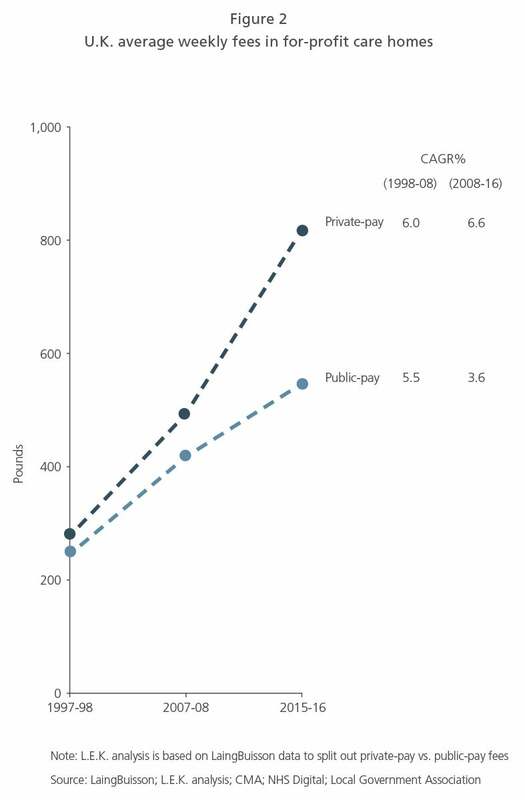 By contrast, private fee rates have continued to increase by 6-7% per annum. Amid budget uncertainty, many LAs have been favouring spot contracts over block contracts with private care providers, further removing urgently needed long-term visibility and certainty of funding. It is clear that the U.K. care homes market is in dire need of both extra capacity and reform. 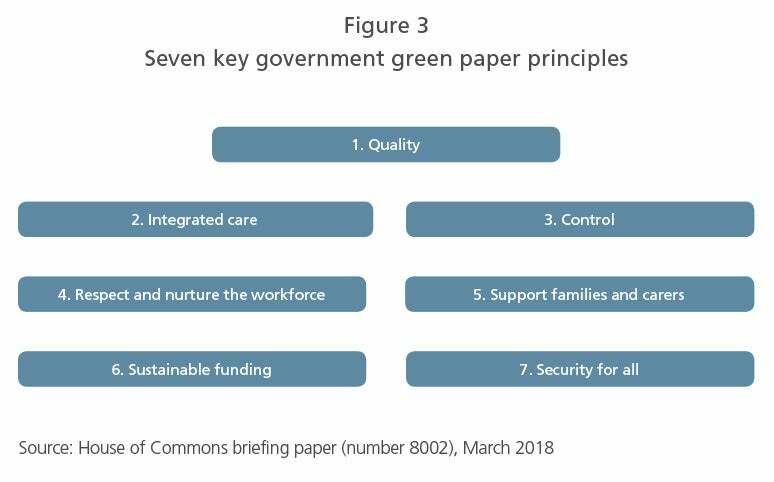 Investigations by the CMA and the Care Quality Commission (CQC) in the past 18 months have highlighted the need for reform, and the government is expected to publish a green paper on this subject in summer 2018 addressing seven main areas (see Figure 3). Despite the history of underinvestment and poor performance, there are a number of positive indicators in the care homes market. The increasing wealth of the ageing population is particularly notable, combined with the fact that a proportion of LAs are paying economically viable rates, at least for value-for-money based providers, such as Care UK, Barchester and HC One (see Figure 4). Many elderly people are able and, in the light of the lower-quality services offered by the public sector, willing to consider paying for nursing or residential care. In a survey conducted by L.E.K. in 2017, more than 45% of those aged over 60 stated they plan to fund care from their own financial resources. Indeed, changing consumer perceptions about care homes have created new opportunities in the private-pay sector, with operators converting public-pay beds into private-pay beds and investing in new, purpose-built capacity. High-quality private-pay care homes are more expensive than public-pay services. Fees average £820 a week, or 30% above those in public-pay homes, and annual price increases average 5-6% to mitigate underlying increases in costs and wages, in particular the national living wage (see Figures 2 and 4). As a result, the private-pay market has seen more investment in recent years, particularly from real estate investment trusts and other infrastructure investors attracted by long-term sustainable rental yields. L.E.K. has analysed care home demand in the U.K., identifying a large number of postcode districts that have sufficient wealth among the local population to fund private care and that also lack recently built, fit-for-purpose capacity. Depending on the wealth criteria applied, there are up to 1,800 of these “hotspot” locations, highlighting the structural demand and size of the investment opportunity in the private-pay sector and parts of the public sector. The private-pay segment of the market will continue to offer attractive investment opportunities, particularly for increasingly sophisticated and consumer-orientated private operators, in what remains a fragmented supply-side landscape where only 25% of U.K. care home capacity is owned by the top 10 providers. With a proportion of the public-pay market known to be economically viable, the government’s forthcoming green paper and response to the CMA and CQC reports should have the medium-term effect of making investment in public care home capacity more attractive and accelerating the flow of funding into the sector. Established private care providers are already reporting a growing interest from LAs in innovative ways of creating and supporting sustainable provision of care homes in the public-pay market – for example, Care UK’s contract with the LA in Suffolk. Nevertheless, the future remains uncertain. If and when government reforms are introduced, budgetary pressures on LAs could still limit the implementation of more fundamental change. Investing in the care homes sector over the past five years has not been straightforward, but leading providers such as Barchester, HC One and Care UK (and some smaller providers) have shown that it can be economically attractive. The expectation is that the green paper and government reforms will stimulate renewed interest in accelerated capital investment. This will likely be achieved through a combination of the public sector’s willingness to pay enhanced rates for value-for-money care and the wealth of the mass affluent stimulating an attractive private-pay market. Initially, providers with existing capacity may find it easier to operate in this market, and it is highly likely that new investment opportunities will arise in the short to medium term. With determination and policy support, the next five years should create much greater opportunity than the past decade did.